Online Readings are quick, and easy ways to find answers to your questions. Buy a Reading you like, send your payment and the information needed. In 2014, I sold over 800 Readings on eBay. This success gave me the chance to help hundreds of people. I can help you too! One of the special joys of Tarot Card Readings is doing it live with me. This allows you to ask questions while the Reading takes place. Buy a Skype/Phone call, send your payment and the information needed. Keep in mind I am in Canada, so our time zones may vary. Traditionally Tarot Readings are done by appointment. If you live in London, Ontario you can come to my location for your Reading. Book a Reading online, you can pay by Paypal, Credit Card or when you come in. Can't wait to see you. 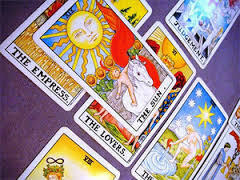 Tarot Card Readings are a nice touch to any event you are hosting. Your guests will benefit from the peace of mind and clarity gained from a personal Tarot Card Reading. A wonderful choice for Wellness events, parties, and small circles of friends.